What is an advance directive and should I have one? An Advance Directive is a written statement about how you want medical decisions to be made in the future if you can no longer make them yourself. Federal law requires that you be told of your right to make an advance directive when you are admitted to a health care facility. The health care power of attorney allows you to choose someone to make your future health care decisions if you are no longer able to make them yourself. This power only takes effect if you are no longer able to make health care decisions and lasts until your death unless you cancel it or include time limits. The agent you choose cannot be your health care professional or health care provider. You can use the Illinois Statutory Short Form: Power of Attorney for Health Care or write your own. Your agent is required to follow any specific instructions you give regarding care you want provided or with held. A living will is a declaration telling your health care provider whether you want life extending measures taken and are you are unable to state your wishes. Unlike a health care power of attorney, it only applies if you have a terminal condition (incurable and irreversible condition such that death is imminent and the application of any death-delaying procedure serves only to prolong the dying process). You can use a standard living will form or write your own, with any specific directions about what type of life-extending medical procedures you do or do not want. You can cancel your living will at any time. A mental health treatment declaration allows you to specify whether you want electroconvulsive treatment (ETC) or psychotropic medicine when you have a mental illness and are unable to make these decisions for yourself. You can choose someone to make your mental health decisions for you, use a declaration for mental health treatment form, or write out your wishes. Your mental treatment preference declaration expires three years from the date you sign it, and you can cancel your declaration in writing prior to its expiration so long as you are not receiving mental health treatment at time of cancellation. A Do-Not-Resuscitate Order (DNR order) is a medical treatment order saying that you do not want cardiopulmonary resuscitation (CPR) if your heart and or breathing stops. 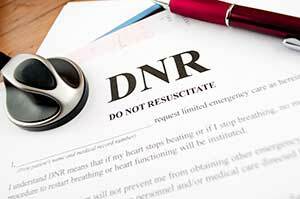 You or your legal representative must consent to the DNR order before it may be entered into your medical record. If you do not have an advance directive and you cannot make health care decisions for yourself, a health care “surrogate” may be assigned under Illinois law. This surrogate will be one of the following (in order of priority): guardian of the person, spouse, any adult children, either parent, any brother or sister, any adult grandchildren, a close friend, or a guardian of the estate. The surrogate can make all health care decisions with certain exceptions (withdraw or withhold life-sustaining treatment unless you have a terminal condition, permanent unconsciousness, or an incurable or reversible condition). A surrogate, other than a court-appointed guardian, cannot consent to certain mental health treatments including electroconvulsive therapy, psychotropic medication, or admission to a mental health facility.